Extra wide burlap is great to use as table runners for weddings and events, banners for parties and other burlap craft ideas. The possibilities are endless! Fall is nearly here and you know what that means – burlap season! As we transition our homes from one season to the next, it’s great to think of easy budget-friendly ways to update our decor. Adding touches of burlap to your decor is one of the fastest and easiest ways to update your home for fall. Burlap is inexpensive, trendy and brings an element of rustic farmhouse style throughout your home. 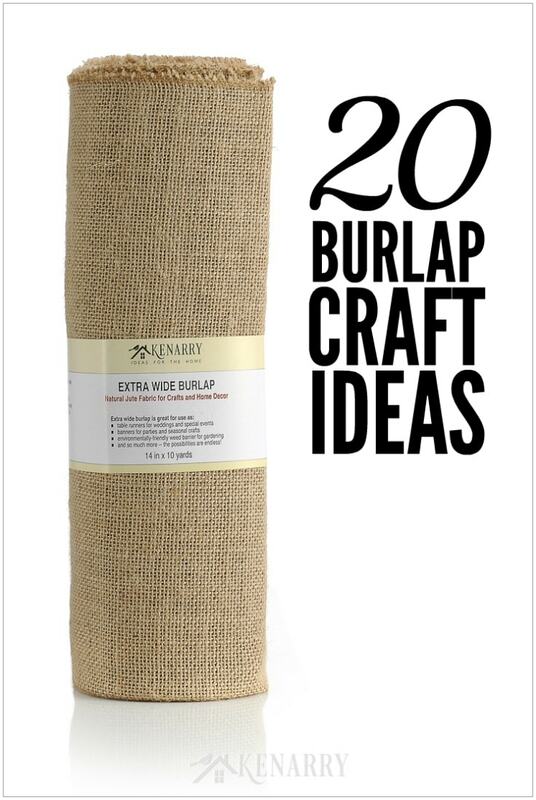 Today we’ll share 20 burlap craft ideas to inspire you to decorate with this versatile fabric in new ways. 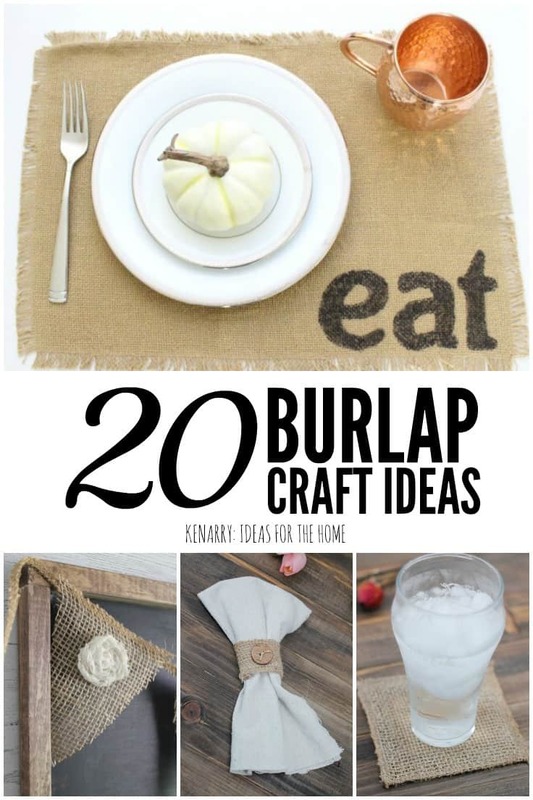 As you may also know, I love, love, love burlap crafts and decor. For a few years now we’ve been selling 5 inch wide burlap ribbon for crafts and DIY projects based on our popular tutorial for how to make a burlap wreath. 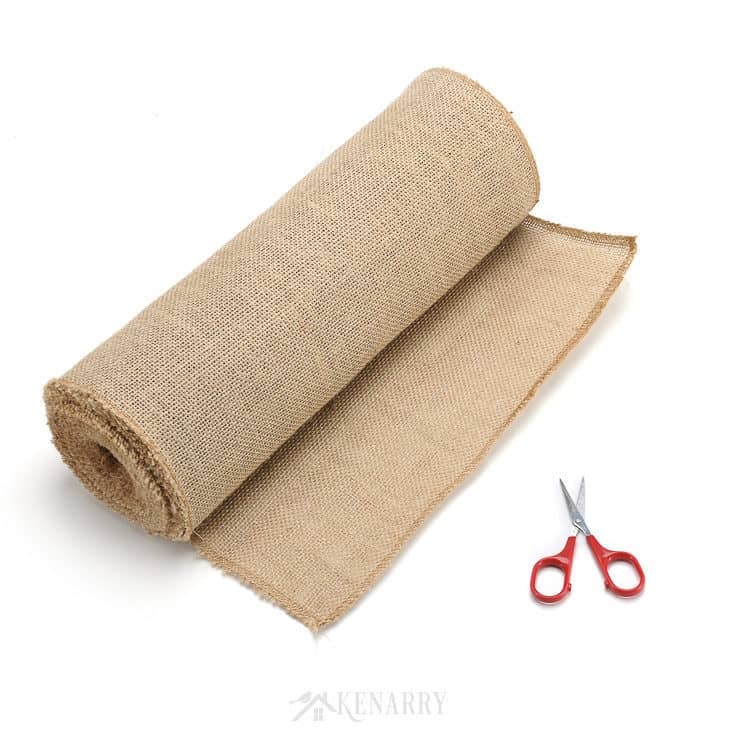 So I’m incredibly excited to tell you we now have even WIDER Kenarry burlap rolls available on Amazon. Each burlap roll is 14 inches wide by 10 yards. 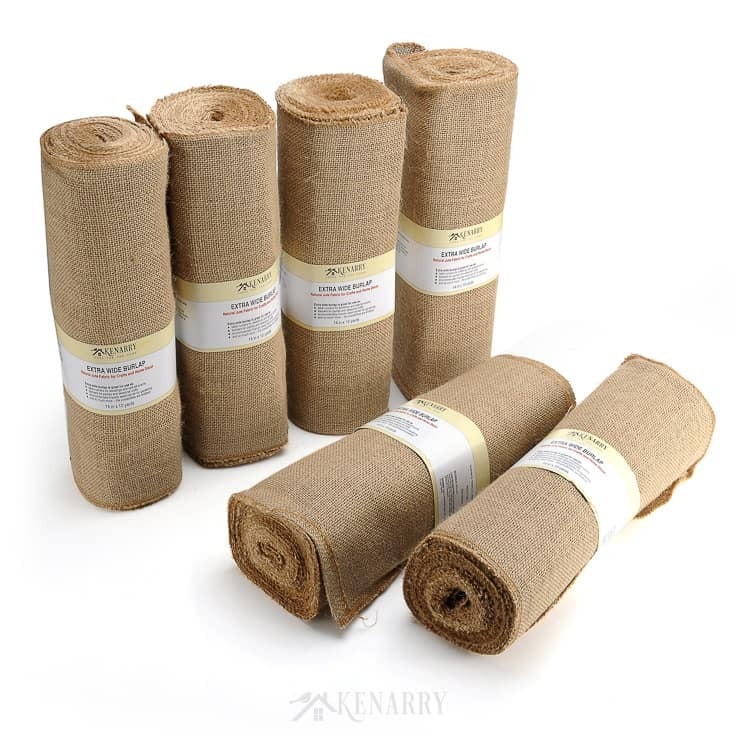 These extra wide burlap fabric rolls are available as single rolls or you can buy multi-packs for crafting in bulk or decorating large spaces and events. All burlap rolls have finished sewn edges to help reduce or minimize fraying. 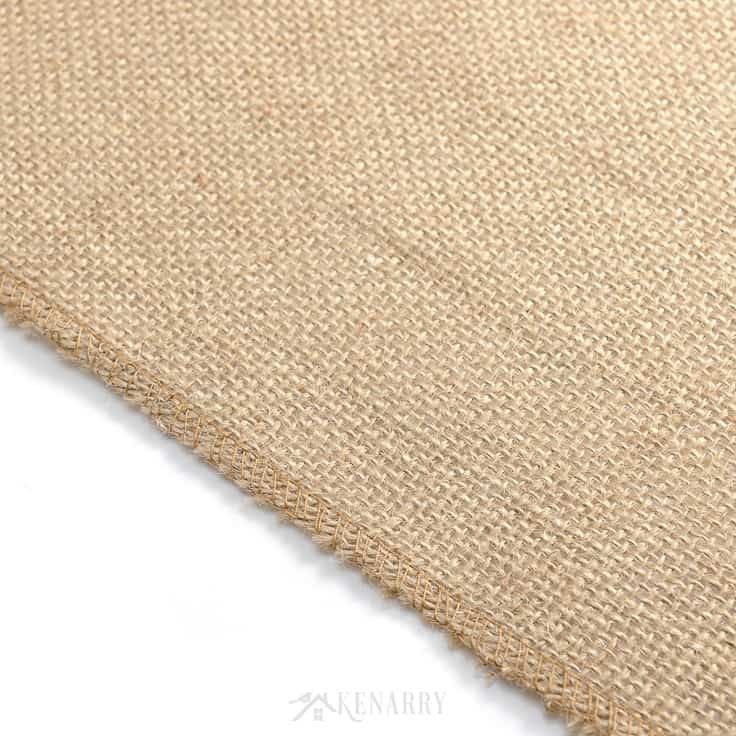 This densely woven jute cloth is perfect for beachy, coastal DIY decor projects, farmhouse or shabby chic crafts and outdoor garden projects too. Create extra large burlap bows to tie on banisters or pillars. Tie it around chairs at a rustic wedding reception. Sew it into burlap coasters to prevent leaving water rings on your furniture. Wrap burlap around fresh flowers when bringing a floral bouquet to a friend. Make a burlap wrapped vase as a centerpiece. Use burlap as gift wrap for presents. Hang it as a backdrop for a memo board or family command center. It’s long enough and wide enough to wrap around the trunk of your Christmas tree to use as a tree skirt. Upcycle an old frame into a burlap serving tray. Loop it down the banister on your staircase. Drape it as a banner to decorate your fireplace mantel. You could even combine it with lace and make it into a pennant banner. Staple it as curtains inside cabinet doors with windows to hide the clutter inside your cabinets. Use as a table runner for Thanksgiving, Halloween, fall and other holidays. Stencil the fabric like these Thanksgiving burlap vases. Trace letters on the fabric with black Sharpie markers to make into fun burlap placemats. Turn it into throw pillows. Make it into utensil holders for forks, knives, spoons and napkins on your dinner table. Create easy napkin rings embellished with buttons or other baubles. If you’ve got an ink jet printer, you can even try printing a design onto burlap to make a pillow cover or to frame as rustic art. Like I said the possibilities of what you can make with burlap are endless! There are even more ideas on how to use burlap in your Christmas decor. 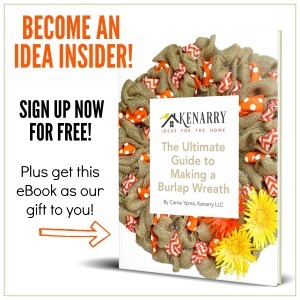 I’d love to see what you create from your Kenarry burlap fabric – just tag me @kenarryideas if you share a pic on Facebook or Instagram.